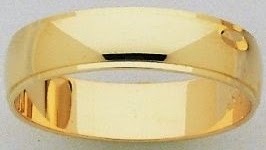 Back in 2012 I published a couple of posts about disappearing wedding rings and how they mysteriously reappeared. The subject has come to life again, and here are two more examples. The first writer wishes to remain anonymous. "Yesterday, I put my rings in the jewelry cleaner. I am a married man with two rings and a chain. I would not notice if a ring was missing. I got into the jewelry cleaner this morning and there was one ring and the chain - but no wedding ring. I looked in the sink etc. Today, as I am getting ready to go to play pool, the wedding ring is on my car seat sitting in the middle of seat. "Having read your post about wedding rings disappearing, I had a similar experience. I know the story sounds far fetched, but I can't explain how it happened. I had been married about six months and have always kept my wedding ring on. From the time my husband put it on my finger at the wedding service there it has stayed. It was a Monday and I had just confirmed that I was pregnant so was in a joyous mood. It was lunch time and so I had a break from my work. I looked at my finger and my wedding ring had gone. I didn't wear my engagement to work, so it was so noticeable that my ring finger was 'naked'. I became frantic with worry and fibbed to my boss that I was feeling sick, so I could go home to search for my missing ring. It may sound childish but I was worried that this was some sort of omen, maybe something was wrong with my pregnancy. I got home and searched everywhere. I was sure that I was wearing the ring when I showered in the morning, so wondered if it had been washed down the shower drain. The ring was nowhere to be seen. I felt uneasy about telling my husband, though I knew he would understand. He came home at about 6.30pm and I told him what had happened. He said it must be somewhere so we searched again but without any luck. Next morning I woke up as usual when the alarm went off at 6.30am, stretched out my hand and there was my ring - on my ring finger, where it should be. I couldn't believe it. I could only think that maybe my husband had found it and put the ring on my finger while I was asleep. He swears he didn't and I believe him. What happened is a complete mystery. I don't know if anyone has an explanation. Those are very strange stories. These stories are infinitely mysterious!